If you have a body mass index (BMI) of 30 or higher, or need to lose 30 or more pounds, the Medically Supervised Decision-Free® Diet Program is designed for you. Our program is especially appropriate for people who have obesity-related medical problems, such as diabetes and hypertension. 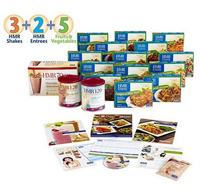 This program is made completely of HMR Shakes, Entrees and meal replacement products. Although average weight loss is 50-60 pounds, many people lose more than 100 pounds following this program.